The fencing travels to New York this weekend for invitationals at St. John’s on Saturday and New York University (NYU) on Sunday. The Irish head into the weekend’s action just a few days after having ranked first overall in the first women’s coaches’ poll of 2015 and second overall in the men’s poll. This ranking follows a 2014 campaign that saw Irish individuals take national titles in the men’s and women’s foil but sixth overall at the NCAA championships. Junior foilist Nicole McKee competes in the DeCicco Duals at the Castellen Fencing Family Center on Feb. 8. Still, the Irish enter 2015 as the only program with a top two ranking in both the men’s and women’s polls, and this marks the women’s squad’s 21st number one ranking. The men have held the first slot in the poll 16 times. St. John’s also earned a favorable position in the year’s initial rankings. After a final 2014 ranking of seventh, the Red Storm men rise to fifth in the poll, and the women sit at eighth. Over the two days of action, Notre Dame will see several top-10 squads of both genders from teams like Harvard and Columbia. This weekend’s inviationals mark the debut of new Irish sabre coach Samir Ibrahimov, whose hiring was announced by head coach Gia Kvaratskhella on Jan. 15. Ibrahimov joins the fencing team after a three-year stint in Hong Kong, where he brought home a number of accolades as the sabre coach of Hong Kong’s national team. The team most recently saw action last November at the Penn State Open although the Irish were missing ten starters due to international competitions. Despite this setback, the Irish earned three medals in both the women’s and men’s competitions. Sophomore sabreist Allison Barry shared a bronze medal with Pennsylvania sophomore Dana Kong. Junior epeeist Catherine Lee and junior foilist Nicole McKee both earned silver medals in their respective weapons. In men’s competition, junior sabreist John Hallsten proceeded to the round of eight until falling to Penn State junior and defending NCAA champion sabreist Kaito Streets. Ultimately, Hallsten earned a fifth-place finish on the day. Looking forward, the Irish have approximately one month between them and the ACC championship. 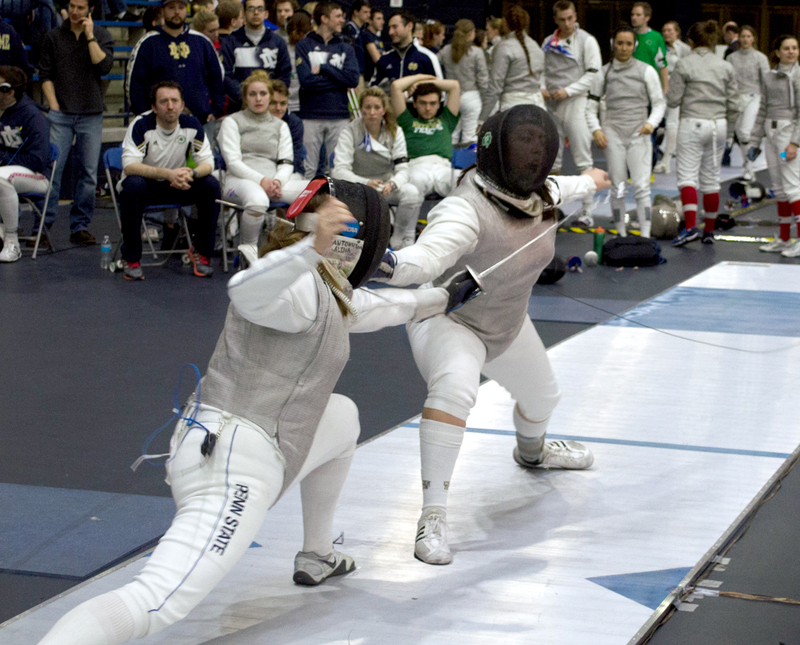 This marks Notre Dame’s first chance to compete in the tournament after having left the Midwestern Fencing Conference to join the ACC in 2014. “I think this year, especially since last year we didn’t do that well, and yet we’ve always been one of the top teams in the country, I definitely think this year we’re going to come out pretty strong,” Emge said. The Irish continue that push Saturday as their season resumes in Queens, New York, at the St. John’s Invitational followed Sunday by the NYU Invitational in Jersey City, New Jersey.